It's Spring Break on Maui! Within the last couple years, mainland schools have staggered their spring break vacations so that everyone is not vacationing at the same time and there is a much better flow of visitors. Maui can be enjoyed without being too overcrowded. Traveling the road to Hana is a must while on your Spring Break to Maui. We recommend booking a van tour as there are 617 hairpin turns along the drive and 60 one lane bridges. The scenic drive can easily turn from relaxing to stressful. Of course you will want to spend some time soaking up the tropical sun at one of Maui's many beaches. This beach guide will help you pick the beach most fitting for you and your family as the waves can still be quite big this time of year. Other fun Maui spring break activities include Ziplining, whale watching and visiting Haleakala crater. P.S. - Kahului Airport ranked #3 in the country for on-time flights. A study by Insure My Trip took data from airports across the nation and Kahului took third with one of the lowest percentages of cancelled flights at .5%. Salt Lake City took the top spot. Pride of ownership is evident in this 4 bed, 3 bath home in Kulamanu, one of the most desirable neighborhoods in upcountry Kula. The fenced-in backyard of this quarter acre lot boasts a tropical oasis of fruit trees, flowers tucked along the rock-walled paths, a large, flat grassy area and a covered lanai perfect for entertaining. Oceanview 2 story cedar home in Kokomo area of Haiku, Maui. Has 3 beds, 2 baths main living area with additional 2 bed, 1 bath “nohana” on a 2 acre productive fruit and flower farm. Upstairs 1,512 sq ft living area has master suite and great room with open beam ceilings, hickory hardwood floors, and expansive windows to take in ocean views, which opens on to 443 sq ft lanai. $1.36M (FS) Wailea gated home mere steps from Keawakapu Beach. Home has 3 bedroom suites with full baths in each, two car garage and is situated in a secluded park. Stunning views of the ocean, South Shore, North Shore and West Maui Mountains from this private 2 bed, 1 bath cottage in beautiful Pukalani. Nicely updated home with a large private yard. Fantastic Avocado tree and lots of hedges for privacy. This well-maintained 3 bed, 2 bath single level home with a 2-car garage is located in a very desirable neighborhood. The property is fully fenced with mature landscape and offers a very private setting. Recent upgrades include new vinyl flooring, brand new appliances and freshly painted interior and exterior. Ocean lovers dream home being sold "turn-key." Located along Maui's North Shore right along the popular surf break "Big Lefts". This oceanfront 3 bed, 2 bath home was extensively remodeled in 2002 and is the last house on the street with direct access onto the beach. Great opportunity to own in a quiet neighborhood in Pukalani. This 3 bed, 1 bath house offers many options and has great potential. $875K Immaculate 4 bed, 2 bath 1,959 sq ft home on a Large 10,067 sq ft lot. This 2 story home is located in the Kulamalu Subdivision on the 7th Fairway of the Pukalani Country club, on the Haleakala slopes, 1,200 ft above sea level. This home shows like a showroom with lots of extra features. $1.05M (FS) This completely remodeled 1 bed, 1 bath, 792 sq ft unit provides the highest level of attention to quality and detail. As you walk in, you will feel the warmth from the velvet textured Italian plaster and appreciate the high ceilings with natural Lau-Hala and bamboo. This open floor plan provides mahogany trimmed built-in sofa & end tables in the living room, handmade mahogany plantation shutters, double zone central A/C, custom stacking lanai and kitchen sliders. Enjoy beautiful ocean views from the living area, kitchen and main lanai of this renovated 1 bed, 2 bath unit overlooking the greenbelt. The kitchen and both bathrooms have been renovated, a large picture window has been added in the living area, the popcorn ceilings are gone and two split-system A/Cs have been installed. Great mountain views and privacy from this 7th floor corner location. Spacious open and bright floor plan with 2 beds, 2 full baths a large Lanai and extra sleeping area in the living room. Unit 4-705 comes fully furnished, washer/dryer, ready for vacation rentals. 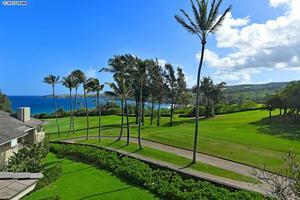 Over 8 acres situated on World famous sandy Kaanapali beach. $2.399M (FS) A dream home at a great price, simply the best! Enjoy outstanding ocean views toward Molokini Island and the world-renowned Polo Beach and year-round sunsets from this remodeled 2 bed, 3 bath upstairs unit. Beautiful, modern, contemporary residence with wood floor interior. The 24 ft. high vaulted ceiling can easily accommodate a loft addition. In a very desirable location, this 1 bed, 2 bath unit is on the inner circle overlooking central common area and pool. Quiet unit close to three of the nicest beaches on the south shore with several restaurants and night life spots near by. Not currently in a vacation program but these units are popular as vacation rentals. Unit has very nice ocean view. A great vacation rental condo in building 2 on the top floor with ocean views from Molokini and Kaho'olawe to West Maui Mountains. This 2 bed, 2 bath condo has a nicely updated kitchen, quartz counter tops, tile flooring and all interior doors have been replaced. This unit is located right across the street from Charley Young and Kamaole I beaches. With a great ocean view, open tropical ambience, two beautifully tiled, extra-large lanais, J-114 is arguably the best 1 bed, 2 bath condominium, in the highly desirable newer Jasmine Cluster at Maui Kamaole in South Maui. This end/corner unit is ideally located between the two resort pools, close to tennis courts, near multiple BBQ areas and has a convenient end-of-row parking stall. $649K (FS) This little gem at The Ridge at Kapalua is priced to sell. The villa is located on the best weather side of The Ridge, allowing for outdoor living 365 days a year and Winter sunsets. Its is a spacious 1 bed, 2 bath, ground floor unit with no stairs. Very clean, well maintained, with a gorgeous ocean view from the spacious covered lanai. This 2 bed, 2 bath is located on the quiet, scenic side of the Grand Champions complex. This recently remodeled unit features the peace and serenity of Haleakala and gold course views from the living room and master bedroom. Conveniently located within walking distance of the famed Wailea Tennis Club, Wailea Blue Course, and some of the world's best beaches. Beautiful brand new 3 bed, 2 bath residence in Keala O Wailea with ocean views, high end Bosch appliances, Grohe fixtures, hardwood floors, quartz counters, ceiling fans, large wrap around lanai, electric sunshades on the lanai, 1 car garage, 1 open stall, pool pavilion with a gorgeous pool, whirlpool, workout room, BBQ's and kitchen prep area. Currently under construction. This 3 bed, 2.5 bath home provides one level living with additional 2 bedroom guest suites on the upper level. Hokulani Golf Villas have been uniquely designed to offer the comfort and privacy of a luxury home, combined with the carefree lifestyle of a condominium. Featuring natural stones, beautiful hardwoods, eco friendly design with soaring 12 ft high ceilings, spacious covered lanais and gourmet kitchen. $3,594,888 (FS) Maui Beach Place, consists of three new contemporary fully fenced and electronically gated oceanfront condominiums. The 2 bed, 2.5 bath Plumeria and orchid units have never been lived in and can now be purchased together or separately. This new construction completed in March 2019 is the ultimate in Kihei beachfront living. Massive Price Reduction. Wonderful opportunity to own a fee simple 1 bed, 1 bath condo unit across the street from the ocean in West Maui. The Maui Lani Terraces are located in the heart of Honokowai, within close proximity to a great beach park and a variety of food and shops. The property features a resort like pool with bbq grills and a workout room for all to enjoy. Super cute studio at Haleakala Gardens was just updated with vinyl flooring and fresh paint and has a very modern feel. Enjoy high ceilings and a garden like setting with plenty of living area and lots of storage. Unit has a loft that is permitted for storage use. Enjoy low maintenance fees in a quiet complex in Kihei. $495K This is a gorgeous condo in one of the best neighborhoods in West Maui. This fantastic 2 bed, 2 bath 2nd floor unit is located in the heart of pet-friendly Napili Villas, minutes away from the finest beaches on Maui. Enjoy a peekaboo sunset view from the front Lanai. There are two assigned parking spots with unit and a small storage closet on the lanai. Looking for an opportunity to build a home of your dreams in a gated community in Upcountry Maui? Situated in the new community of Kualono, tucked in a cul-de-sac and offering all the comforts of Upcountry living, sits Lot 21. Conveniently located near Carden Academy, Seabury, Kamehameha Schools Maui Campus and King Kekaulike High School.